The construction of a new parking lot at Mount Benson Regional Park is ongoing. Visitors to the park and those headed to the Witchcraft Lake trailhead should expect delays and increased truck traffic. Please use caution when approaching the site and obey all signs. Work is anticipated to continue until June 2019. We thank you for your patience while we complete improvements to our regional park and trail. Mount Benson Regional Park in Electoral Area C was acquired by the RDN in March 2006 for $950,000, half of which was fundraised by the Nanaimo and Area Land Trust. Overlooking the City of Nanaimo, the 211 ha MBRP straddles the upper north-east slopes of Mount Benson and features rough mountainous terrain ranging from 457 m to 1,006 m above sea level. 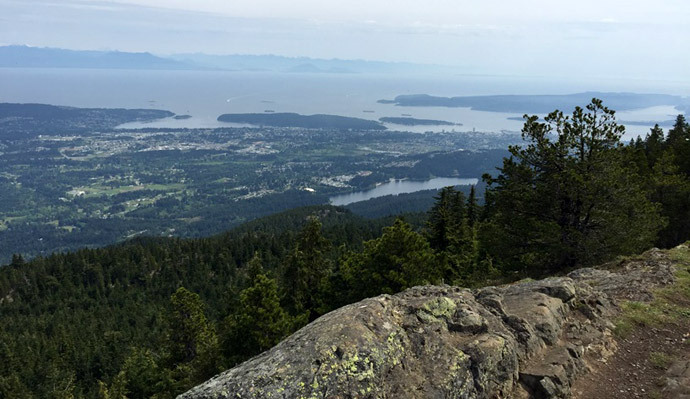 Views from the park are panoramic: look out over Nanaimo to the Strait of Georgia and the mainland beyond or feast your eyes on the peaks of central Vancouver Island's highland mountains. 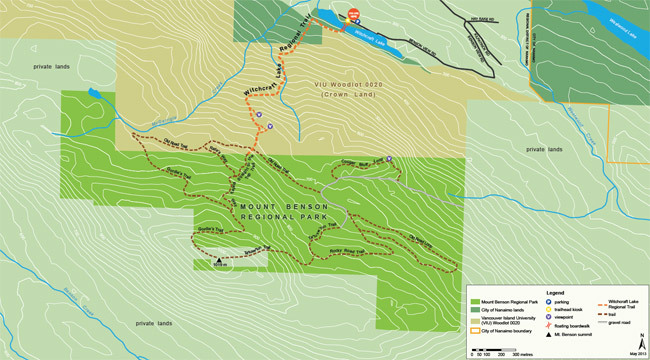 The 2010-2020 Mount Benson Regional Park Management Plan was completed in 2009 and formally reviewed in 2015; please click here for details. A conservation covenant in favour of the Nanaimo & Area Land Trust and the Cowichan Community Land Trust was registered on the park titles in March 2016; please click here for more details. MBRP boasts a great diversity and abundance of wildlife habitat and contains the headwaters of Witchcraft and Westwood Lakes as well as the Millstone and Chase Rivers. Rugged mountain trails and old logging roads allow users to explore the park and reach the summit of Mount Benson, which is located outside park boundary. Come and experience the mountain and the high value wildlife habitat corridors that the park provides within the central Vancouver Island mountain range system. Allow five to seven hours to get all the way up and down the mountain. Good physical health and stamina are required for the climb, as are appropriate footwear, clothing, safety gear and water. Beware of fast changing weather and the early arrival of snow and icy conditions. Play it safe: don't head out alone and always tell someone about your plans. The Witchcraft Lake Regional Trail is the only authorized public access to MBRP. The trailhead is located on Benson View Rd (off Kilpatrick Rd, off Jingle Pot Rd, off Hwy 19).